Brands can create social media posts containing anecdotes, photos, videos, or other material and their fans and followers can then interact with these posts by liking or commenting on them (Vries et al, 2012:84). In addition, the increasing dominance of images over words and their omnipresence in today’s communicative culture have often been deplored (Stoeckl, 2009:4). Stoeckl (2009) compared the semiotic modes between ‘picture and language’ in advertising and concluded that whatever the design behind image and [language-]linking might be, advertisers are keen to use them as strategic tools to effectively develop their arguments, and because the ads are semiotically minimalist, recipients need to invest some decoding efforts in order to generate communicative relevance and sense. In the following exercise, we analyse a given tweet from ESPN FC using the four levels suggested by Stoeckl (2009): semiotics, perceptual/cognitive, semantics, and pragmatics. We chose a tweet from @ESPNFC dated 31 January 2016 that includes a picture and text breaking the news of John Terry leaving Chelsea FC at the end of the season 2015/16. In regard to the tweet at hand, the image shows John Terry, alone, on the pitch with his fists in the air, possibly cheering after a goal or a victory of his team. The copy of the tweet says, “John Terry has announced he will leave Chelsea at the end of the season. [line space] MORE: es.pn/1NJN5HB” The copy is indeed discrete, however, to the point. Emphasis lies on the word ‘MORE:’, which is spelled in capital letters and points to a link to the full article on the ESPN FC website. As noted by Stoeckl (2009:8), the image in the tweet can be assumed to have a strong impact on understanding and memory and is directly tied to emotions. Stoeckl (2009:8) claims that there is a weaker impact to memory and no direct tie to emotions in regard to language. Nevertheless, I claim that the recipient of the message needs to be considered in this case. The copy alone can have a strong emotional impact on fans of John Terry and/or Chelsea FC, given the impact Terry’s move can have on the club. As mentioned above, ‘the image shows John Terry, alone, on the pitch with his fists in the air, possibly cheering after a goal or a victory of his team’. The image alone, without copy, can be interpreted in different ways. Being published on a football-Sunday, it can just mean that Chelsea FC won the match today, or John Terry signed a new contract at the club, etc. In terms of semantics, this image is indeed ‘semantically dense’. Solely by looking at the image at hand, it cannot be assumed that John Terry will leave the club. Therefore, as noted by Stoeckl (2009), a content-thematic copy that narrates actions and explains logical relationships is in order. 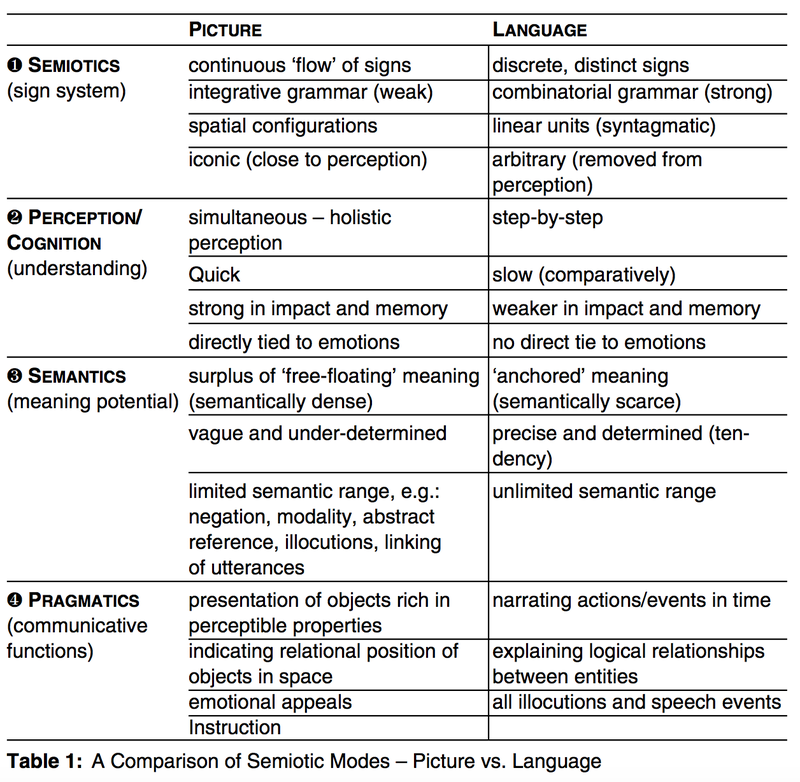 The four levels of mode differences as described by Stoeckl (2009) – semiotic, perceptual/cognitive, semantic, and pragmatic – are an effective way to analyse the relationship between images and copy in social media. Even though the trend towards more visual content seems to overtake the Internet, the opportunity to creatively play with the linkage of images and words can be fertile ground for new possibilities in marketing communications. I highly recommend considering the gaps that the above-mentioned four levels can fill in respect to each other and stretch the boundaries of their relationships. Thinking in terms of memes might be the most fruitful way to push the envelope. Source: Hartmut Stöckl (2009:8) Beyond Depicting. Live video broadcasting on Periscope: What’s in it for a football club?